Well, it's that time of year again. Even though much of Canada's eastern half is currently experiencing pretty warm temperatures (24 degrees in Charlottetown today? Wowsers! ), much of the country has already experienced some cooler-than-seasonal temperatures. And as the calendar flips over from September to October, it's inevitable -- Autumn is here. 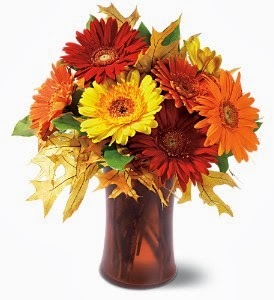 We've seen great response around our Autumn-styled bouquets around this time of year, and this year is no different. Many of these bouquets feature colours that mimic the changing of the leaves and gorgeous flowers that can bring a charming, rustic look to any room in which they're placed. Plus, with Thanksgiving coming up in a couple of weeks, many of them would make for a perfect adornment or centrepiece for your dinner table. We all know winter will be here before we know it. Instead of battening down the hatches and going in to hibernation mode, let's make the best of this season that, from coast-to-coast, is an emphatic reminder of how beautiful of a country Canada really is. Here are 5 of our favourite bouquets, designed especially for this season. This assortment shines for its simple palette, yet it is a beautifully complex arrangement. 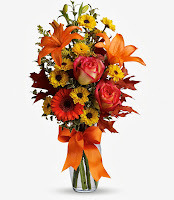 The Autumn Burst arrangement features roses, daisies and orchids in all the colours of the season. Gerberas continue to be a trendy, popular choice with our customers, and part of their popularity can be chalked up to their versatility. 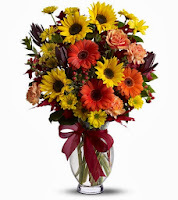 In this arrangement, yellow, red and orange 'Gerbs' are contrasted by an assortment of rustic greenery. This arrangement is just the perfect blend of traditional and contemporary styles. 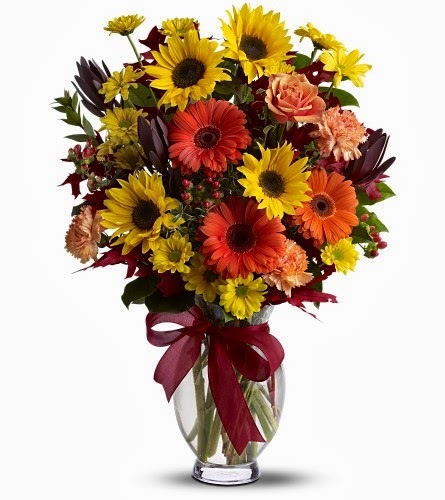 Classic Sunflowers and Chyrsanthemum is offset by the popping colours of Gerbera Daisies and Roses for an elegant, lovely bouquet. 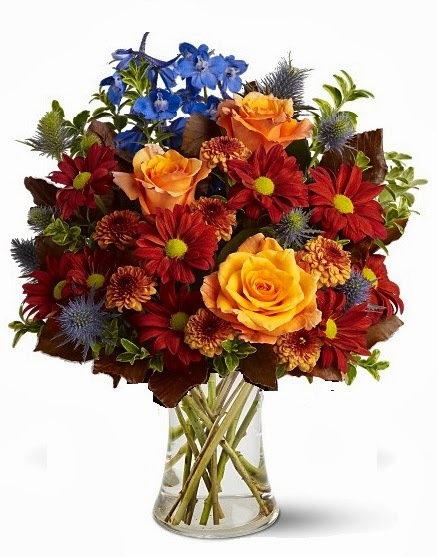 The Autumn Rustic bouquet might not be what's expected, but it's a fresh take on the rustic theme, with unexpected splashes of colour complimenting traditional reds, yellows and oranges. 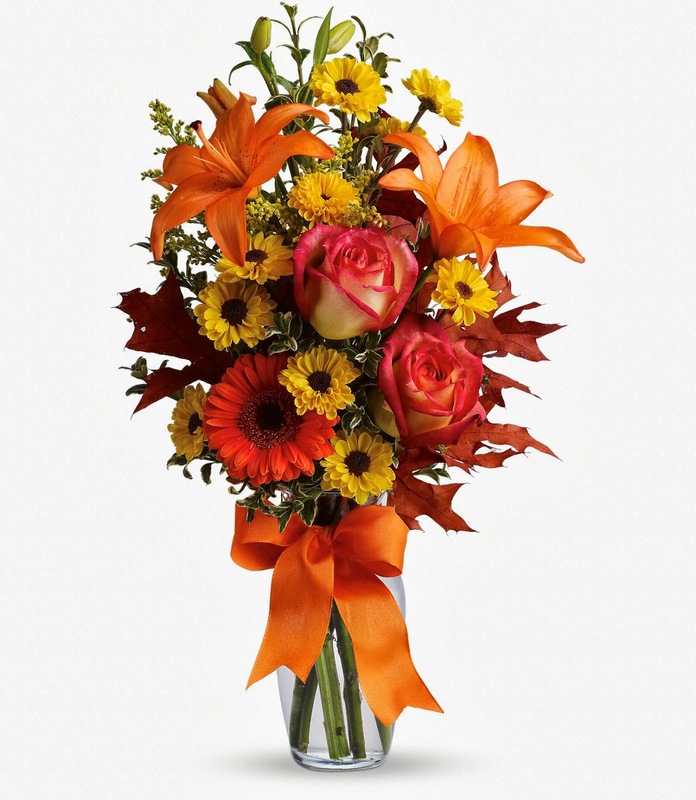 This bouquet is an eye-catching work of art. 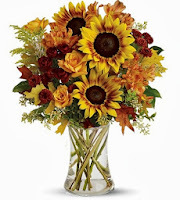 Beautiful Sunflowers serve as a pastoral, picturesque focal point, complimented by shades of burnt orange, red, and backed by assorted greenery and filler. Just perfect for a Thanksgiving dinner centrepiece, and in fact, dazzling for any occasion.